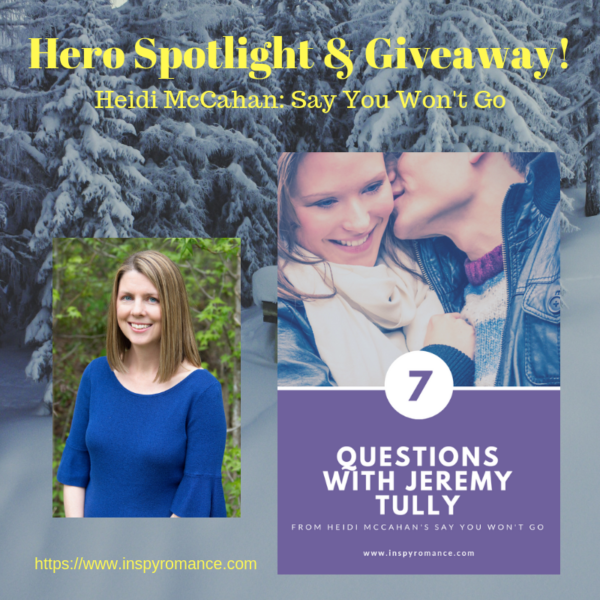 I’m excited to welcome former Inspy Romance blogger Heidi McCahan! She is taking over, today, to interview the hero in her newly released novel Say You Won’t Go. Hello, Inspy Romance readers! It’s the most wonderful time of the year, and one of my favorite ways to celebrate is to enjoy the sweet romance movies and novels that have become a “hallmark” (see what I did there?) of the season. I don’t know about you, but I’ve already watched a couple of delightful Christmas movies and read at least two Christmas-themed novels. While I’m certain Mary and Joseph didn’t have Netflix or the Hallmark channel in the stable when they welcomed Jesus into the world, those of us celebrating our Savior’s birth in this century seem to devour the wholesome holiday entertainment that is right at our fingertips. I guess there’s just something about finding love and celebrating a happily ever after that makes us swoon and reach for our hot cocoa. Given my enthusiasm for all things Christmas, I’ve always wanted to write a Christmas novel or novella, and I also wanted to release a sequel to my first book, Unraveled. The concept for a heroine who is a professional snowboarder dealing with a humiliating social media post developed quickly, but I struggled to create a hero who fit into the storyline. I tried writing a couple of different heroes, yet they seemed to miss the mark. Then a handful of readers asked me if Jeremy Tully would ever have a chance to ‘star’ in his own story. If you haven’t read Unraveled yet, Jeremy is a secondary character in that novel. From the minute he strolls on to the page, he has so much … swagger. Suddenly it all clicked! Emerald Cove, Alaska is a wonderful setting for a Christmas novel, and Jeremy is the perfect hero to compliment my feisty, wayward heroine, because his life has gone a little sideways as well. Without further delay, let’s shine the spotlight on one of my favorite fictional friends, Jeremy Tully. I’m a former reality TV star and a whitewater rafting and kayak guide. Right now, I’m working at a ski resort in my hometown of Emerald Cove, Alaska and trying to get my life back on track. I have a lot of regrets, too many to share here. My biggest regret is that in my quest to be the life of the party, I forget my actions have consequences. I’ve hurt a lot of people because I didn’t think about how my choices might impact the people I care about most. Dating hasn’t gone well for me in quite a while. In a perfect world, I’d say watching the Northern Lights together while drinking coffee or hot cocoa. Time travel and the ability to go back and change the outcome of certain events. Silent night by candlelight on Christmas Eve. Three people to dinner, living or dead? Basically, Jeremy is a hot mess at the beginning of Say You Won’t Go. Alyssa’s in rotten shape as well. Oh, how I love a redemptive story. One of my favorite authors, Susan May Warren, encourages writers to take characters from broken to whole over the course of a novel. Isn’t that a magnificent word picture of what the Lord is doing in our lives too? Whether you’re having a delightful holiday season or slogging your way toward the end of a difficult year, may I remind you of a few simple truths? Our God reigns, He creates the best stories, and every single one points to our Savior, who offers hope and redemption to this hurting world. 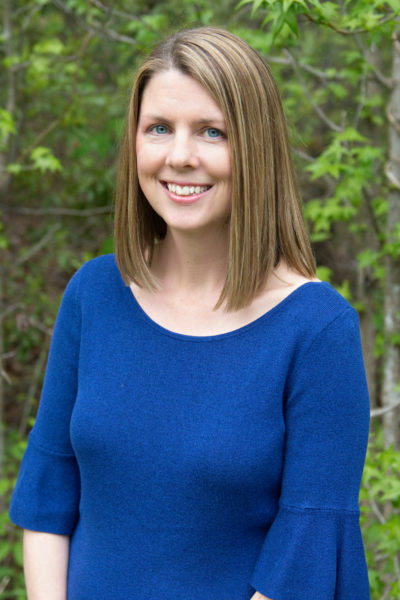 Heidi McCahan is a Pacific Northwest girl at heart, but now resides in North Carolina with her husband and three boys. When she isn’t writing inspirational romance novels, Heidi can usually be found reading a book, enjoying a cup of coffee and avoiding the laundry pile. She’s also a huge fan of dark chocolate and her adorable goldendoodle, Finn. She enjoys connecting with readers, so please visit her website, heidimccahan.com, and sign up for her newsletter. Once your subscription is confirmed, you’ll receive a free novella, More Than Words. Professional snowboarder Alyssa Huard arrives in Emerald Cove, reeling from a humiliating betrayal, and desperate to escape the social media firestorm sidelining her career. 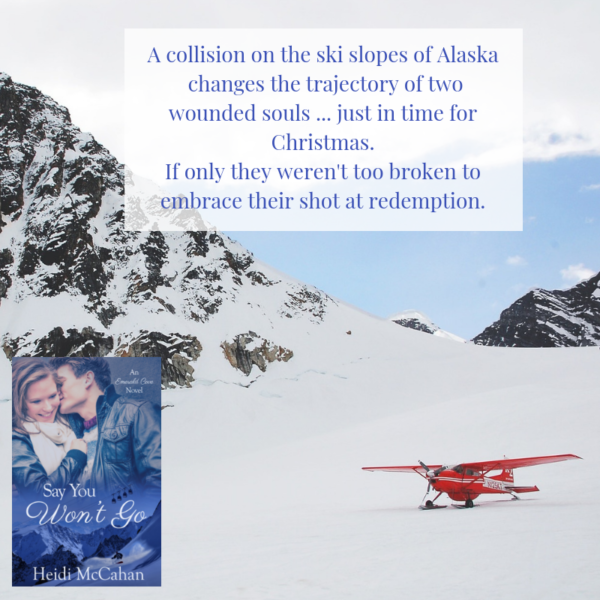 When she collides with Jeremy on the ski slope, she instantly despises him, and he’s not thrilled about a sassy, self-absorbed athlete crashing into his world, either. While filming a snowboard commercial less than a week before Christmas, Jeremy and Alyssa are trapped in the unforgiving Alaskan wilderness, and she is forced to rely on him. Despite warning signs that this woman is all wrong for him, Jeremy is tired of playing it safe. Alyssa begins to trust him, but can their fragile bond survive when they’re confronted by their pasts? Heidi has graciously offered a Giveaway! One autographed paperback to a US resident, one e-Book to an international winner (void where prohibited). Please leave a comment by December 2, 2018 sharing the name of your favorite Christmas song or carol, and she’ll randomly choose two winners. Silent Night is my favorite carol! Hi Janet and Heidi- welcome back:) I loved Say You Won’t Go! This was a fantastic story! My favourite Christmas carol- O Come Emmanuel or Baby Boy by For King and Country. It’s a great book! I love Oh Come Emmanuel! I’ll have to look up Baby Boy! Awww, thank you very much. I’m so glad you enjoyed the book. I am a new fan of For King and Country, mainly because I heard their new album promoted on the radio. So good! I’ll have to check out their Christmas songs as well. Hi Janet and Heidi! Heidi, best wishes on your holiday release. The story sounds intriguing. As a German American, my favorite Christmas carol is Stille Nacht, Heilige Nacht / Silent Night, Holy Night. I have heard the carol sung in 19 different languages. Frankenmuth, Michigan has a replica of the chapel and explains the history of the carol. This year is the 200th anniversary of the carol. The carol was first sung Christmas Eve 1818 in a small Austrian chapel accompanied by guitar. In the movie Joyeux Noel the carol stopped WW1 on Christmas Day. A carol with a rich history and magnificent heart warming lyrics and recognizable melody. Always enjoy singing this carol with a candle lightening ceremony. Best wishes and Happy Writing. Thank you, Renate! Thanks for sharing the history behind that beautiful carol. I look forward to hearing and singing it every year. Good morning, ladies! Thanks so much for the guest post! My favorite Christmas song is I’ll Be Home for Christmas….my favorite Carol is Silent Night! Hi Paula Marie! Silent Night seems to be at the top of everyone’s list! Hi, Paula Marie. Thank you for taking the time to comment. I enjoy I’ll Be Home for Christmas too! Favorite Christmas carol, that’s hard. I love so many. Maybe O Holy Night or What Child is This. Those are both great songs! It is hard to pick! I know! We have so many wonderful songs and carols to choose from. I like the ones you mentioned a lot. Thanks for commenting, Sherri. My mom loved that! I would love to have a white Christmas! Hi Kim! We are definitely hoping for a white Christmas around here. I love Oh Holy Night, too! Merry Christmas, Lucy! O Holy Night is so lovely. I never get tired of hearing it. Like your character I have regrets but I’ve learned to live in the present and let go of regret. I love silent night Thanks for all the great stories all the great authors write. Thanks, Brenda! Yes, we have to let go! Silent night is a fav of mine, too! So true, Brenda. Thank you for stopping by and commenting. Merry Christmas! Good to see you again, Heidi! My favorite carol is One Small Child. I just love it. I’m not sure I remember it. I’ll have to look up! Thank you, Valerie. I’m happy to be here! I have not heard that song yet, or at least if I have, I do not know the title. I’ll go check it out. One of my favorite is Baby It’s Cold Outside. I heard Lady Antebellum’s version of this song in the car yesterday. So well done! I think What Child is This is at the top of my list, but I love a lot of them! Oh, that’s a great one! Another beautiful song! Merry Christmas, Margaret. Hi, this story sounds intriguing. And yes, I agree that God creates the best stories. I would love a paper back version if chosen. I enjoyed the interview. What a great concept to interview the characters. God’s blessings your way. Thank you, Dawn. It’s a fun way to write a blog post and one of my favorite methods for sharing more about the characters. Merry Christmas! Favourite Christmas songs: “When My Heart Finds Christmas.” By Harry Connick Jr., and “Mary did you know?” (Pentatonix and CeeLo’s versions are both fabulous). Merry Christmas from Seattle! Oh, Oregon is someplace I’m wanting to go! It is a great book! Two great songs! Harry Connick is so good! Merry Christmas, Charlotte! I love the Oregon coast as well, and I’m so grateful for our friendship. Thank you again for reading my books. I’ve enjoyed listening to Pentatonix a lot this holiday season already. Sooo good! Thanks for the spotlight. This book sounds wonderful! My favorite Christmas song is Silent Night, followed closely by O Holy Night. Beautiful choices, Winnie! Thank you for stopping by and leaving a comment. It’s hard to choose just one but I really love Casting Crowns’ version of I heard Bells on Christmas Day. Oh, that version is beautiful! Makes me teary-eyed every time. Merry Christmas, Jessica! I love Christmas music too much to pick a favorite, but one of my favorites is Pentatonix’s version of Little Drummer Boy. My mom loved that song! I’m listening to Pentatonix on Pandora right now! They are so talented. Merry Christmas! I have always loved Silent Night! That seems to be the winning song! My favorite is Mary did you know? Love it! One of my favorites as well. Merry Christmas! Heidi – I loved your book! One of my favorites is Joseph’s Lullaby and I really love MercyMe’s version of it. No need to enter me in the drawing since I already have the book! Thank you very much! I do not know Joseph’s Lullaby. I’m going to go and listen now. I love Faith Hill. A Baby Changes Everything and Where Are You Christmas are two of her songs that I listen to again and again this time of year.